It is such a joy to be outside these days with the birds calling from nearly every tree and bush, I’m thrilled to be alive to witness the renewal of another spring. After this past, bitterly cold winter, these warm, sunny days and blue skies are balm for the soul. I hear a redwing blackbird call from the river’s edge and the warblers, who returned a few days ago, sing from the woodland trees. Flashes of yellow, they establish new territories and hunt for insects in the thick brush. I hear and see robins, cardinals and catbirds and I heard my first wood thrush last night, always a highlight to my day when I hear their melodious song. 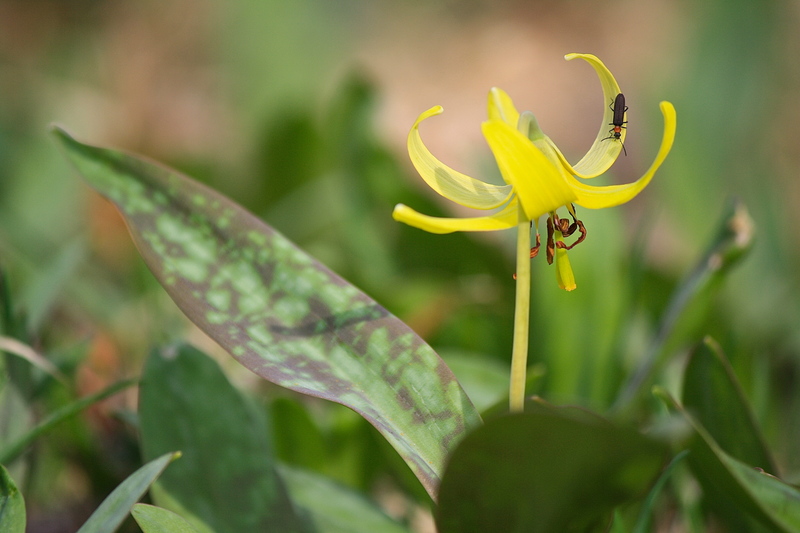 Along the woodland paths, the dog-tooth violets/adder’s tongues/trout lilies (Erythronium americanum) bloom. Their many common names refer to features like the fang-like shape of the bulb and the brown and gray-green mottled foliage. Another wildflower currently blossoming are red trilliums/wake robins/stinking Benjamins (Trillium erectum). The latter common name refers to their unpleasant scent, which attracts carrion flies that pollinate them. 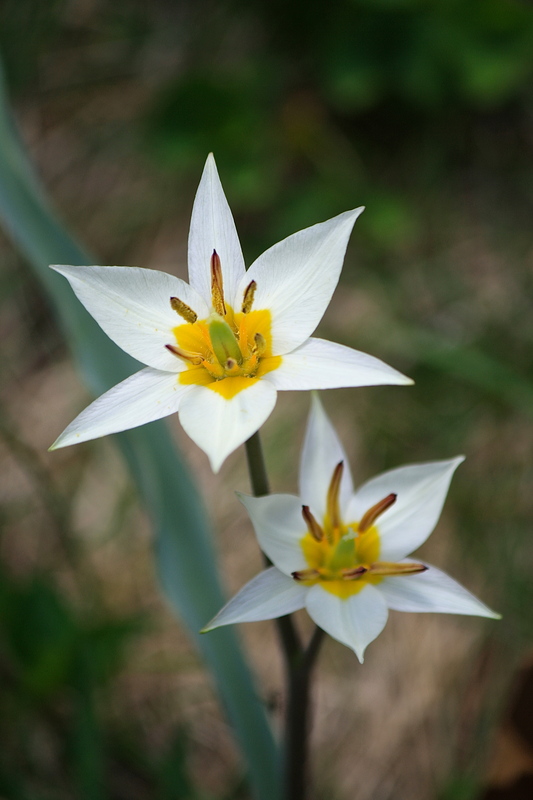 ‘Trillium’ suggests the three petals and leaves of this common woodland native. Their rich, red color is a sight to behold. 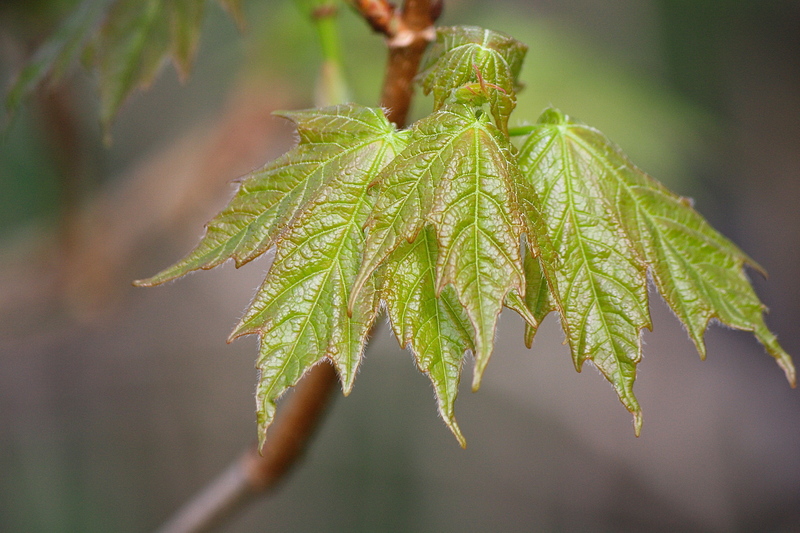 With the warm weather we’ve been having, the leaves are unfurling almost overnight. The long vistas we enjoyed over winter are about to disappear for the next six months as the leaves extend to exploit every bit of sunlight. The woods will become hushed, shady retreats once again. I look forward to hearing the whispering of the wind as it gently tosses the leaves, a sighing sound that holds peace for me. 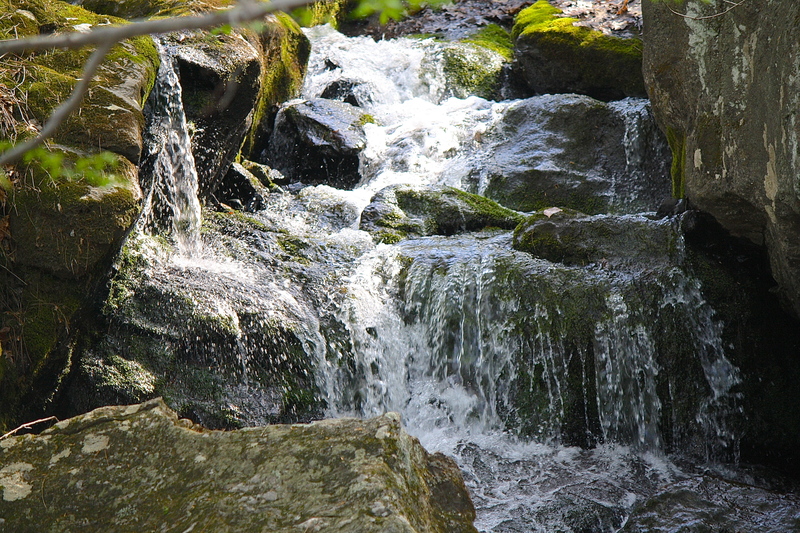 The waterfall adds its quiet rushing to the music of our yard. The spring melt, which always swells its flow, has finished and it is not as noisy as it was. The stream and river are a blessing, attracting wildlife to our land. 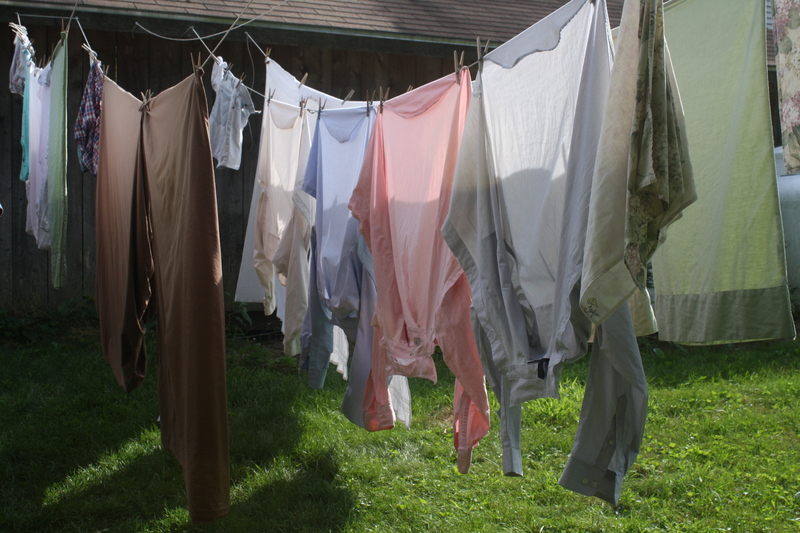 Clean laundry flaps on the clothesline, nature’s free drying service that offers the freshest of scents. 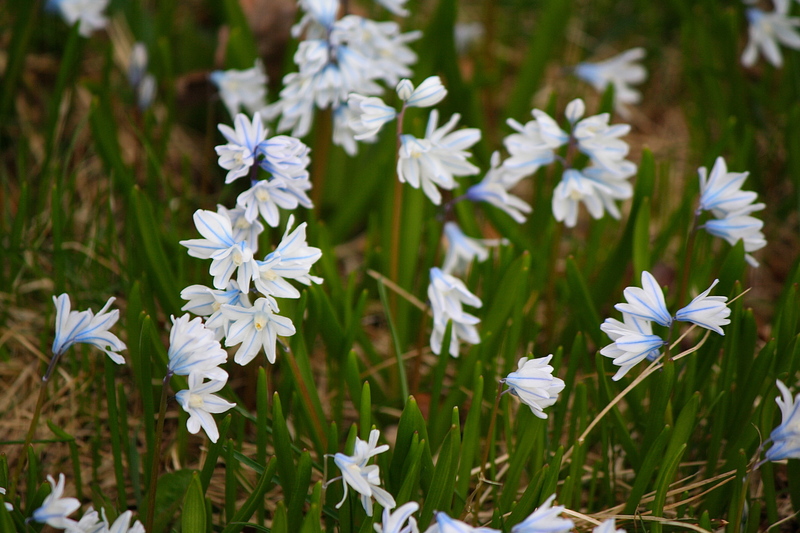 Nearby, violets and self-sowed spring bulbs dot the lawn. With no chemicals to knock them down, our lawn is alive with color and scent. Monocultures are not healthy for us or the land, and I find them rather disturbing and boring when I see them. Nature’s way works best for me. I love this time of year, as the whole of the warm season lies ahead of me. Months of open windows, breathing the fresh air, with days spent outside in sunlight and under shady trees, drinking in all the abundance that nature generously offers. What a blessing! 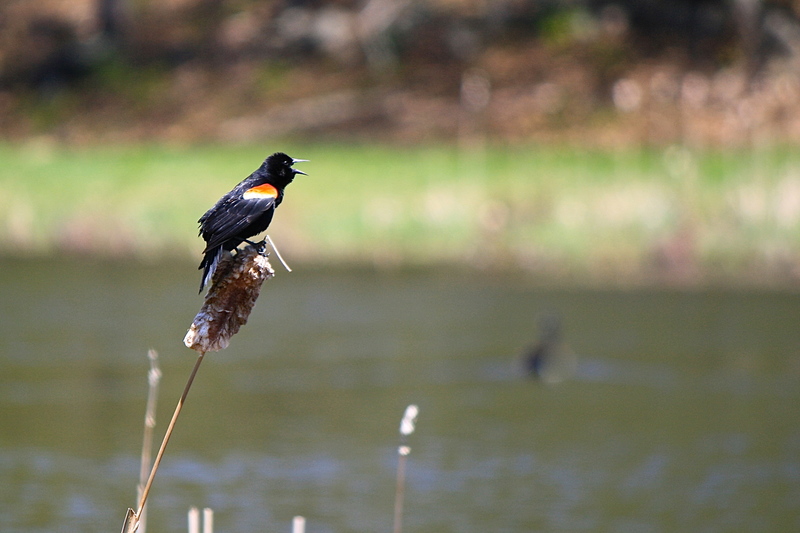 This entry was posted in Country Living, Field Notes, My Photos and tagged Erythronium, migrant birds, red-winged blackbird, river, spring, sunlight, trillium, violets, warblers, Waterfall, wildflowers, woodland flowers. Bookmark the permalink. What a wonderful spring interlude with you. Thank you. The laundry on the line, dancing in the wind! Extra special. Thanks so much, Catherine. We seem to be the last to have spring reach us! It makes it all the more sweeter, don’t you think? Beautiful glimpse into gorgeous flowers, ferns, and streams. Enjoy the sunshine, thanks for sharing! Thank you kindly … yes, it is!! Beautiful post, Eliza. Brightened my day. Thank you, Kate. So glad to hear it! Thank you so much, Julie. I was shocked to learn that many suburbs have clothesline bans. I hope yours doesn’t and you can get a space for your own ‘green’ dryer. 🙂 Hmm, fresh sheets! A clothesline ban?! I’ve never heard of such a thing. How ridiculous! I’ve always used a clothesline, up until I moved back to the city – it’s just a matter of not having the space for one here, that’s why I’d have to ‘rig’ one up, maybe I can get a retractable type. I’ll trade you the long vistas for warmer weather any day! Thanks, Dor. A day in the life of a country gal, lol. Hope you have a pleasant Mother’s Day! A delightful walk through Eden led by a knowledgeable and eloquent guide. I hope this is a page from your upcoming book. Oh, I love to hear all the bird song telling me it’s spring! Lovely scenery and shots. Thanks so much, Fi. Spring is such a gift after winter, isn’t it? Wishing you a great weekend! What a beautiful spring flowers you have over there! Thank you, Jonas. Spring is a delightful time of year! Thanks for stopping by, appreciate it! Oh yes, it’s wonderful to have the doors and windows open isn’t it! Such a lovely post Eliza. 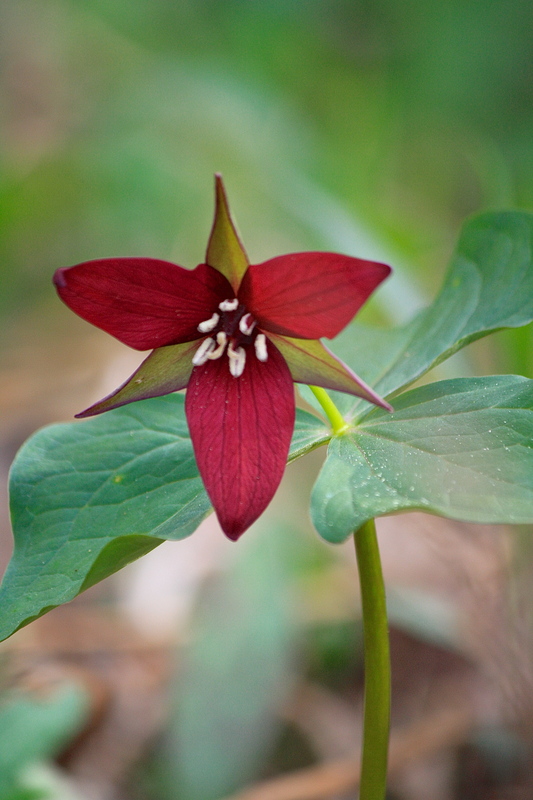 I have never seen trillium, and your red one is quite something. Do you smell them before you see them or do you need to get up close to them first? It seemed to turn green overnight here too. I think we are only very slightly ahead of you now judging from the last photo. Thank you, Cathy! The trillium thankfully do not scent the air and once you get down to smell one, you’re not likely to do it again- lol! It jumped from days of 10C to 25C suddenly last week and everything has leapt ahead. Prior to that, it was creeping along. It has been rather dry, so we’re beginning to get fire warnings. I don’t complain, the rain will probably come soon enough. I’m taking the sunny days while we have them! Have a great weekend! How wonderful to feel I have just been immersed in one of your spring days Eliza – your descriptions of the sights and sounds are beautiful. Thank you so much for your kind words. 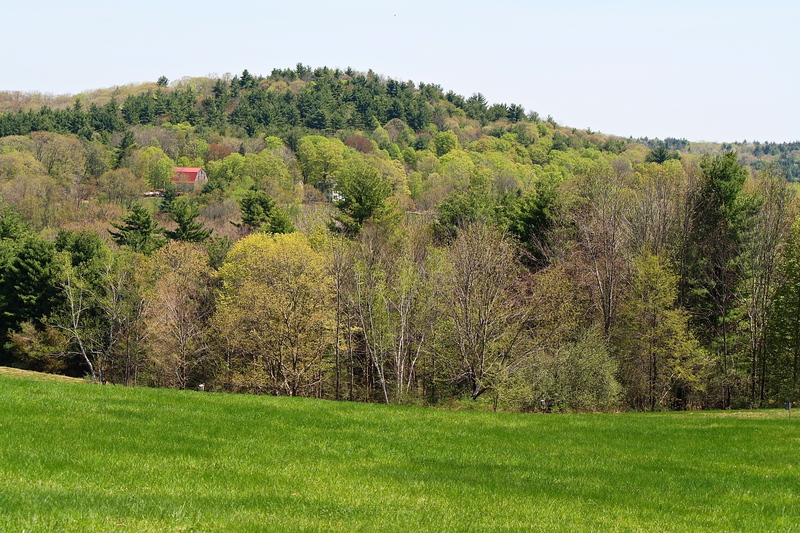 This is the time of year where it really is wonderful to be living in New England! I appreciate your visit. Happy weekend – do you celebrate Mother’s Day in Ireland? If so, happy day to you! Thank you for sharing your spring with us. Beautiful sights, and I can well imagine the sounds (especially of the waterfall). I am currently revisiting Spring. I’m at our old homestead in NE Ohio (where our youngest son and daughter-in-law are now living). It’s been wonderful seeing the spring flowers again as we are practically into summer on the Eastern Shore. I’ve never seen a trillium before. It’s beautiful. Thanks, Robin. Trilliums are the cardinals of the wildflower world. I would love cloth or wool that color, imagine a scarf or nice jacket?How nice you get to visit your old home and get two springs! What’s happening in the pond? The old carp (known as “Jaws” because he was huge and all you saw was his fin when he would slowly swim by) died. Our son picked up four young carp at a pond clinic to make up for him. The bass and blue gills need to be fished out because there are tons of them. They have made their shallow bowls in the bottom of the pond and have laid their eggs (judging by how they were guarding the “bowls”). Green frogs were ponging. And most exciting of all, I heard a bullfrog! The last few years we lived there, it seemed as though the bullfrogs have given way to green frogs so it was nice to hear a bullfrog. Bluets, violets, ground ivy and dandelions are blooming like crazy. We never chemically treat our lawn, either, so there are always flowers of some kind in the grass. We always delayed the first mowing because of that, and some mowing in the summer months when the summer wildflowers are blooming. The pond sounds like it is teeming with life – how wonderful. I expect you miss it, but the ES estuaries have a lot of life as well, I suppose. Enjoy the rest of your visit with your family. HMD! Oh Eliza this is so beautifully written! I, too, am enjoying the dewy mornings and the songs of birds and I just planted a trout lily in my garden! The hummingbird showed up last evening. The Serviceberry is in full bloom. The dogwoods are leafing out and my Pin Oak is just budding. I love to sit evenings in the garden and stare up its handsome trunk. I saw my first Wood Thrush ever at the North Carolina Arboretum – so beautiful! I would so love if a Wood Thrush visited my garden. What kind of Warblers Eliza? I’m guessing Yellow Warbler based on your description. I love those. At the Park where I’ve gone back to work, there are fields of Spring Beauties. Thank you, Kathy. Sounds like spring is awesome in your neck of the woods as well. The wood thrush’s voice is that of angels, I do believe. We have mainly three types of warbler: yellow, common yellowthroat and chestnut-sided. But we’ve also seen blue, black & white and redstart. I LOVE their music! Water and thick, brushy growth are optimal for attracting yellow & CYT warblers. The chestnut-sided I see most often in the tall cherry trees that edge the river banks. I have CDs of birdsongs (mixed with gentle music) that I often play in the winter so that I can hear the songs I long to hear. One of my favorites starts with the wood thrush – pure heaven! Hallelujah! Eliza, we’ve just returned from the famous DuPont gardens at Winterthur. What a celebration of native plants. Absolutely no tortured parterre gardens or topiaries. The forests and meadows are teeming with all native blossoms including millions of trillium(s?) I didn’t know this plant before now. Also just acres of a type of anemone, if I remember correctly Grecian. It was such a revelation. Also, clothesline bans are everywhere here. None of the planned communities allow them. I remember as a young wife yearning for the day we could afford a dryer as I pulled frozen diapers off the line. Now I’m casting an eye about for just where I could I place clothesline. The sheets, if nothing else, the wonderful smell of sun-dried sheets. Winterthur sounds fabulous, a place I’ve never managed to visit. I’ve been to Longwood and Duke Gardens and recently the Biltmore, of course. There’s the far-off dream of touring the National Trust gardens in the UK. If I wait much longer, I’ll be doing it in a wheelchair! I would not be happy about not being allowed to air dry my clothes. Particularly the sheets, what a delight to slip into that fresh scent! I like that you used cloth diapers, not many of my contemporaries did. I loved seeing them on the line and sun was a perfect sanitizer, nothing like it. Now, more young mothers are turning to cloth for healthier and greener reasons. And the new designs make it pretty easy. Did you ever read my ‘Laundry Meditation’ post? http://wp.me/p3O3z4-3T It pretty much sums up why I love it. I hope you are able to string a few lines up. Have a great MD weekend! I’m in the minority here but I prefer Richmond’s Lewis Ginter Botanical Garden to Longwood. Don’t get me wrong, Longwood is fabulous but Lewis Ginter presents things in a more approachable way to the home gardener. Longwood is high drama and opulence and a huge WOW! factor. Both have their place, that’s for sure. Thank you, Sue. The redwings are quite showy, and as they are among the first migrants to show up, their calls tell me that spring has really come! Thanks for the reblog! Happy Spring! Lovely photos…doesn’t laundry dried in the sun smell so much better! It totally does! I love line-dried laundry. Thanks for stopping by and commenting – much appreciated! Thank you so much Jenna. So nice to hear from you! I suppose you are getting all cozy preparing for the winter ahead. It is amazing to think about our seasons being opposite, another of earth’s marvels. If not for its tilt, we wouldn’t have the seasons. How boring it would be to have only one type of season all year long! I’m so glad you’ve got full spring! 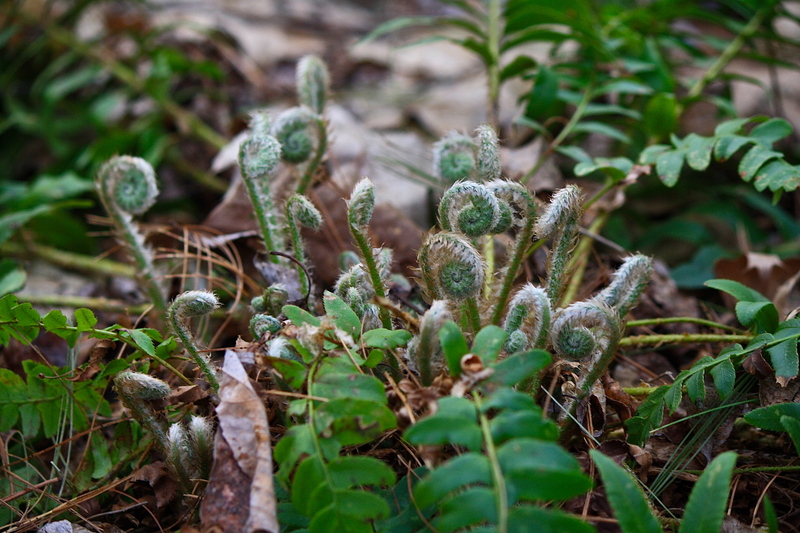 Your fiddleheads are a definite sign, along with the other woodland flowers. I’ve always loved dogtooth violets, them and spring beauties on a forest floor. What a beautiful post and that last photo–with all the green coming up–just marvelous. Thank you so much! It is so nice to finally be in the warm season once again! I don’t like monocultures, either, Eliza. Nature is filled with variety. It’s all the more beautiful for it. Agreed! Nature does it best. Thank you for sharing your piece of heaven with us! Your pictures are beautiful and your words, fit so wonderfully. I recently went to the Daniel Boone National Forest in Kentucky last month, and noticed white and red trilliums for the first time. I do so love the wild violets, fiddle heads, ferns of all sorts, solomon seal, and all the flowers you shared. We don’t have any of those here in NM. I am going to New Hampshire next week to see my goddaughter graduate from college. I look forward to seeing some of your sylvan friends there. Thank you, Mary. You will be in for a treat as May is the best month to be in New England, IMO. In what town is your goddaughter’s college? Congrats to her! There’s nothing like sun and wind dried clothing! And bedsheets! Thank you, Melissa. Yes, it is all the summer possibilities that lay ahead of us! Thank you for the walk around your garden, Eliza 😉 So happy to see it has awakened and is renewed for another season! You’ve taken me back a few weeks into that exciting period when you know that spring has settled at last and snow is now only a memory. Love all of your photos today, and especially your waterfall and wildflowers. I hope the air is sweet and warm today. You have such a long wait for spring each year. Now that you have flowers, will you be cutting a few for a vase today? Good reminder about the vase. I have so many photos to process from the weekend, that I may pass this week, but I keep thinking about it every Monday! The air is sweet, but a bit hot and humid today. Not fun to be outside, so I’m working on my next post instead. 🙂 If I can get through the photos! The photos take the time they take 😉 It took me hours with the OR photos, and they still aren’t all edited. I hope you aren’t like my partner… he wants all of the flowers to live out their natural lives in the garden. He cringes whenever I cut one still in bloom 😉 An inside day here, today, too. We may go into the 90s tomorrow and it is very humid and rainy with the storm still close at hand. Yes, I saw that the storm was swirling just off shore and you were getting some rain. Seems a bit early for hurricane season, doesn’t it? The unfolding of Spring is so special this year … the warm temperatures caught me by surprise too. I love how your captured the ferns unfolding. Yes, it is a great unfolding! Thanks, Val! May is my favorite month for so many reasons, one is the sweet unfurling of ferns and leaves. A glorious awakening! Your pictures are the epitome of renewal. Lovely post! Thank you, Ana. I’m so glad it is spring! Beautiful photos and I have to agree that laundry smells SO nice when it is hung up to dry. Truly. Same for the places that won’t allow rain water collection. Total insanity.